Well after a little spring cleaning around the "Cove". I've moved this infomation from another page and even did a little expanding on the items. I have gotten some overseas Rapala Mini-guides and a couple of books. This too will be added as I sort it all out. I also have a couple of interesting Items. 1. Rapala Mini Fishing Guide. 1 page multi-fold. This guide contains some info on models, a color plate. It also has a few graphs detailing colors to use under different lighting conditions. a graph on what lure/size for species. and a chart showing depths for each lure. Most of the Info is in a foreign language. It still offers some interesting info. the color plate is very useful, it shows a couple of color patterns that I have never seen before. 2. Rapala Mini Guide. View Cover. 3. Rapala Tacklebox Fishing Guide. View Cover. 1 page Multi-fold. 1 side has info on, The Rapala cardinal rules, how to tie on a Rapala and how to recognize each Rapala at a glance. The other has info on, how to pick the proper Rapala (species/lure chart), Rapala color selections, the proper colors, how to tune a Rapala and a lure/line depth chart. 4. Rapala Mini guide. View Cover. 1 page multi-fold.Basic Info. Some lure info along with graphs showing Species chart, Lighting chart, knot chart and a color plate. This mini guide is also in a foreign language. The color plate again is very interesting. 24 pages including covers. Besides rapala's this guide/catalog has products by other companies. I hope to add some scans of these mini guides. A: The Rapala Fishing Guide. View here. B: How to Clean a mess of fish.View here. 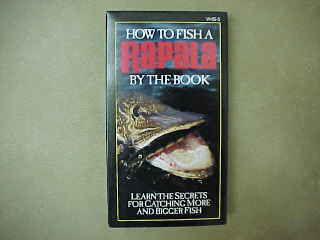 D: How to fish a Rapala by the book.View it!! E: Rapala Fisherman's catalog.View it! 1981 Ed. Another interesting book. It contains lots of info. I have included 2 other scans from this book. View it A page out of the book showing a picture of the Rapala factory in Finland. How to fish a Rapala by the book video. A very interesting tape. Full of great photography. Dated 1994. 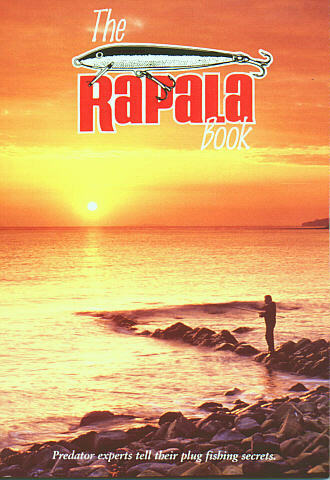 G: The Rapala Book.View it. A super book. A collection of great articals from the top Europen Anglers. Yes this is a U.K published book. It has a lot of info and stories. This is a great addition to my collection. Badge? Ok, we americans call them patch's. This badge comes from the U.K. 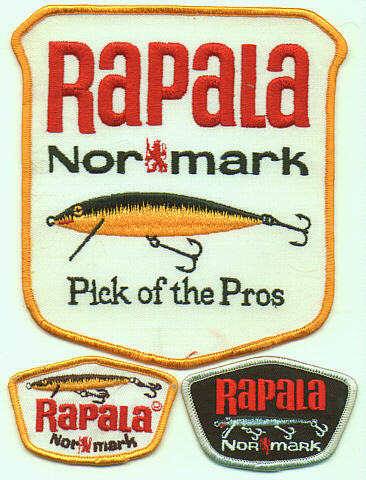 I: 3 Rapala Patch's.View here. 3 different Rapala patch's I have. Here's a area that I will be expanded quite a bit. Besides some of the Original Ad Flicks I have, I'm also going to include some of the better magazine ad's I have. Rapala Banner: New to my collection, A 3 ft by 5 ft, 3 color Rapala banner, 2 sided. Very nice!! I hope to have a photo of it here soon. I just added this banner. I will get photos of both of these relly soon and will update then. This one is all white with "RAPALA" in red. Click on 'Next' to get to..
A new Messege Board feature added to the "Cove"